Sirius has received the 2018 Enduring Architecture Award from the NSW Australian Institute of Architects. Accepting the award, Tao Gofers said “the story about Sirius is about people first and buildings second. Sirius is a symbol of people and communities getting together to demonstrate to governments that their actions must be tempered by concern for their constituents more than the pockets of their friends and supporters.” Read Tao’s full speech below. Open to buildings of at least 25 years of age, the Enduring Architecture Award recognises achievement for the design of buildings of outstanding merit, which remain important as high quality works of architecture when considered in a contemporary context. 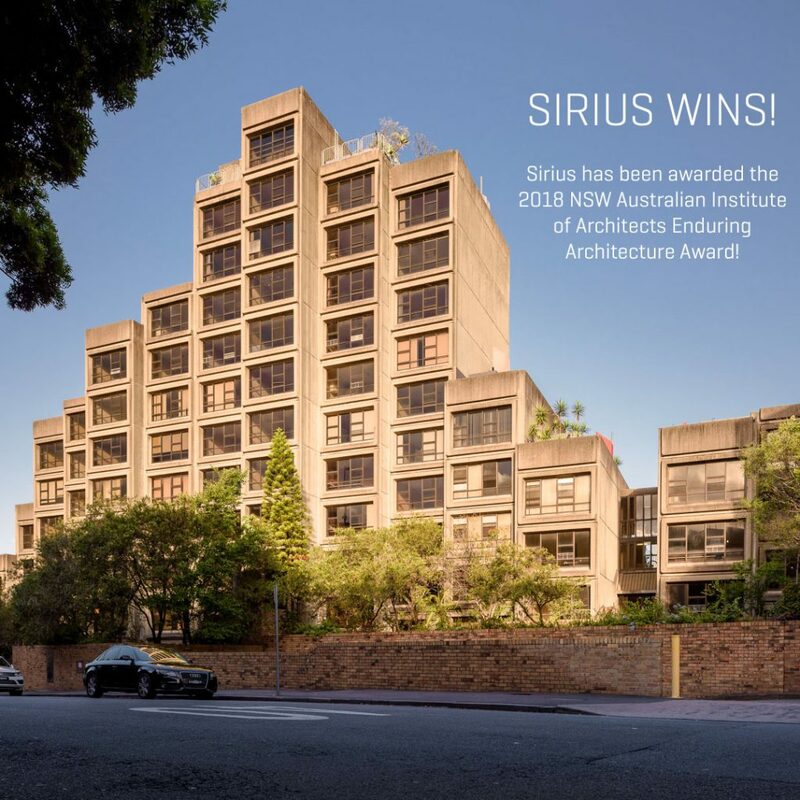 Sirius is included on the Australian Institute of Architects Register of Significant Buildings and now takes out this award as the future of the building is uncertain. Sirius was nominated by Carter Williamson Architects & Save Our Sirius. Read more about the awards. Hi Tim. I am extremely pleased that you are here to present this award for Sirius. When I received word that Sirius had been chosen for an Award I was both pleased and somewhat mystified until I had a closer look at the title the Enduring Architecture Award. and realised this award was quite appropriate for Sirius. for several reasons. Hopefully, it will endure for many many more. Second- Initially Sirius endured at least 10 to 15 years of intensive negative criticism some quite offensive and others quite witty and humorous. One particular example which springs to mind was when Norman Day a Melbourne based Architectural Critic on his pilgrimage to criticize Sydney’s Architecture and Architects stated “that Sirius would have been perfect for a scene in the movie “Clockwork Orange” NOW for years I thought this was a compliment until I watched the movie. But enough about enduring. How about a little Sirius History? The resulting Millers Point community uncompromising reaction to his attitude created an atmosphere that to foster the Green Bans Movement. The Green Ban on Millers Point and the Rocks helped to not only save a Community but also created a tourist destination which attracts hundreds of thousands of visitors every year from all over the world. But Sirius is really more than a building. It’s an amalgam of all the people and organisations that have contributed towards what it is today, a symbol of what people can do to preserve community and heritage when they work together. A brief description of Sirius may be appropriate here to explain why, unlike most other Housing Commission apartment buildings of that era, Sirius fostered a living and viable community over many years. There are 79 apartments in the complex which are made up of 17 aged pensioner units with the rest a mixture of 1, 2, 3 and 4-bedroom units. An attempt to create a better demographic profile for HC apartment buildings. Sirius also has three internal community areas- The largest is the Phillip room which was designed be used by tenants and others for relaxation and assorted functions such as birthday parties and even weddings. The timber linings and cave art sculptures created a unique space for a HC complex. On the eight floor is another community room, which was specially designed for aged and handicapped pensioners with a large balcony (about 4 by 15 M) for them to watch New Year’s Eve fireworks and other Sydney Harbour displays. For any nostalgic tenant, the whole south wall of the Heritage room is covered by a computer-generated mural of the 1978 Sydney skyline as seen from that room. A large viewing platform on the top of Sirius was used by tenants for New Year’s Eve Bar-B- Ques and some private viewings of the Harbour. Of the 79 units, nearly 70% (55.3) have either balconies, roof gardens or private courtyards, several of the 3 and 4-bedroom units have both courtyards and balconies. The roof gardens were part of the original design concept not only to provide additional private outdoor space but also to create a fifth elevation as 90% of Sydney siders only ever saw Sirius from the Harbor bridge approach. My involvement with Sirius was significant and of course, I was quite pleased with my contribution to Sirius. but no building comes into being on the back of one person, especially not Sirius. This award indirectly recognises other people that influenced the creation of Sirius. Jack’s-Green Ban concept also inspired numerous people to form various Green Political movements and other Conservation and Heritage movements throughout the world. Petra Kelly was one person I remembered she was so inspired by the concept of Green bans she started the National Green Party of Germany. 3- Another Jack was Jack Bourke Chairman of the then Housing Commission who supported Sirius and the concept of creating social housing communities instead of just buildings. His enthusiastic and unceasing support of Sirius ensured its survival during the documentation and construction stages as well as the first five years of occupation until his death in 1987. But as I stated before, the story about Sirius is about people first and buildings second. Sirius is a symbol of people and communities getting together to demonstrate to governments that their actions must be tempered by concern for their constituents more than the pockets of their friends and supporters. I believe that in the future Sirius should be saved for affordable and essential services housing, for any city like Sydney by definition must be inclusive, for without its nurses, firemen, ambulance officers and baristas it is just a grey barren landscape dotted with sick people who can’t get their morning coffee. Finally, the thanks for this award comes not only from me, and the Sirius building, but also from the Miller’s Point Community for their unstinting support, from the many professionals that freely provided their expertise and time, from the general communities who love Sirius, and also from the many public organisations that reversed their earlier opinions about Sirius and were unafraid to voice them. This entry was posted in news and tagged architects, architecture, australian, award, carter, enduring, gofers, institute, nsw, ross, shaun, tao, tim. Bookmark the permalink. A great man once said, A city that is not inclusive must therefore be exclusive.